Siri’s gender and voice accent is different based on the region, with a female voice for USA and Australian users, and a male voice in the UK. 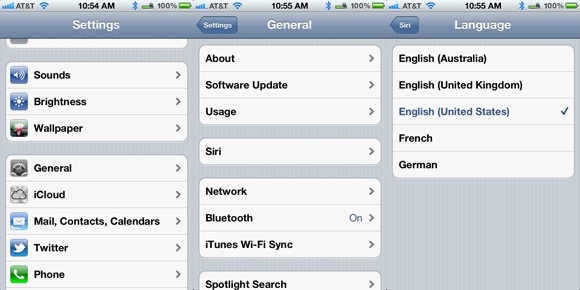 Regardless of which location you’re in or where you bought the iPhone, you can change the gender and the accent of Siri yourself just by switching the language settings. This works in all versions of iOS that have Siri support, and it’s the same on any iPhone or iPad with Siri as well. This is a fun tip from MacTrast, but don’t be surprised if you end up changing Siri’s voice back to the default setting for it to work at its best with your accent. @JGKunzler reports that it worked ok for him, but your mileage will vary. Talking with a drawl and extending vowels makes the Aussie version work fine for my US accent, harder with the British version. Try asking for directions to a business when YOU are in the US and using the Australian voice. No dice. I reprted the logic error to Apple – I speak English English but live in the US and have to use English Siri to be understood. English Siri assumes I’m in England, duh!, and refuses to find restaurants, etc. It is easier than that he is changing voice control you can leave that alone above voice control is language go into there and change from British/English to English this will change Siri to female without compromising voice control problem solved. I’ve changed mine to German, the woman has a lovely voice. Doesn’t speak very good English though, for a German. I would like Siri voice to be a “Pissed off Scottsmen”. I want siri to sound like YODA!! how would I be able t do this if at all possible. I would like mine to sound like a boyfriend. This does not work on my 4s with iOS 6. Siri used to be male or female in the United States. Why was the male taken away? I prefer the male gender, so have to use the UK, but such a strong accent!